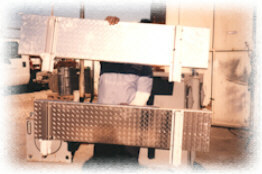 Team Washguy 2002 version of the "Wash-All" unit awarded to Houston Firm. 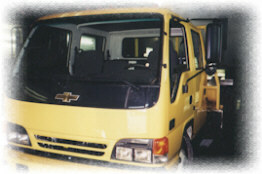 The team includes Lawrence Marshall & Sonic Automotive Group(SAH symbol for the NPR Isuzu trucks www.cvisuzu.com). Beds are made by Southwest Truck Body, an oil welding and service company whose clients include names like Chevron, Conoco, Haliburton, Schlumberger, and other Houston based oil titans. The equipment team includes our newest vendor for equipment, Industrial Pressure Washer in San Antonio. They supply equipment to many municipal roll-over washes. They are also a Hydro-Tek dealer. 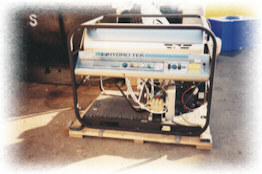 Below is a Hydro-Tek machine built in California. Trucks and equipment are made in TX, while injection molding water tanks in Colorado sold through a Phoenix, AZ distributor. These tanks, both fresh water and reclaim, are made in Wash Guys official colors. To learn more about reclaim systems click here. By involving team partners in many states, Wash Guys is able to keep our total package a secret from competitors. It also keeps us from being beholden to component makers who aren't willing to give us their best price. We are very aggressive in achieving our goals to use our economies of scale or perceived future buying power to command the best price on the equipment our franchisees and team members purchase from our O.E.M. Vendors. 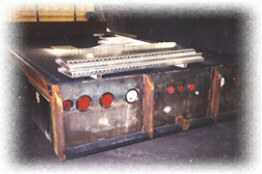 Raw materials come from one of the largest steel brokers in Houston. This gives Southwest better cost advantages over their competitors. With steel import taxes up and a potential turn upward in prices, these advantages should prove to be useful in 2002. Steel and stainless are used in our construction along with a large amount of aluminum diamond plate, as shown in the following photo. 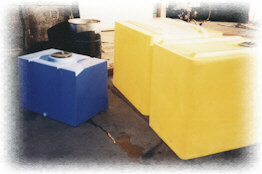 We have lowered the price of this "Wash All" unit from $54,000 to $48,000 in the last 18 months. Of course we cannot guarantee that steel prices, truck prices, polypropylene, aluminum, and other component prices will not change upward or downward in the future. But we can guarantee that we will constantly seek competitive bids from vendors. To see other vendors who build our equipment click here.